Can the FOX reboot rekindle the fire? Has the Love Connection TV show been cancelled or renewed for a second season on FOX? The television vulture is watching for the latest cancellation and renewal news, so this page is the place to track the status of Love Connection season two. Bookmark it, or subscribe for the latest updates. Remember, the television vulture is watching your shows. Are you? A dating game show on the FOX television network, Love Connection sets up “Singles” with potential “Matches” in hopes that they can make a true “Love Connection.” In each episode the Singles explain to host Andy Cohen what they want in a Match, and why they have had a hard time finding someone, so far. The Single and each potential Match also discuss their dates. Eventually, the Single chooses one to take along on a romantic getaway. In the end, if the Single chooses the same person the audience selected, he or she will receive $10,000.00. However, Singles who have chosen a different partner must pass on the cash prize to go on the getaway with their original choice, or dump their Match, take the money, and try to make a “Love Connection” with the audience’s pick. So romantic. The first season of Love Connection averaged a 0.68 rating in the 18-49 demographic and 2.34 million viewers. Find out how Love Connection stacks up against the other FOX TV shows. 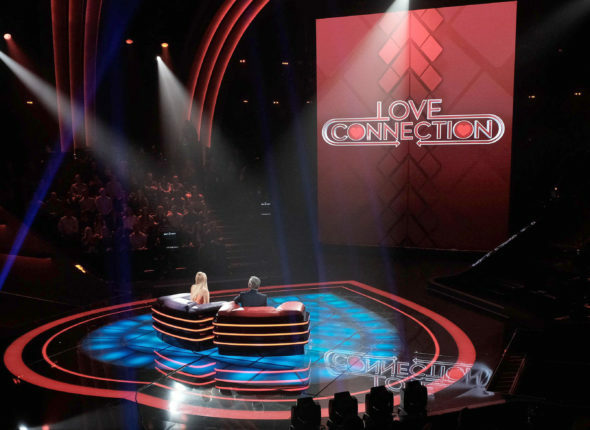 On August 10, 2017, Love Connection was renewed for a second season. Stay tuned for further updates. This show premiered with middling numbers for an unscripted FOX series and the ratings for the Love Connection have been dropping. A renewal looks doubtful. Since I am a starving sentimentalist, I will keep a yearning eye on the ratings and update this page from time to time. Subscribe for free updates on any Love Connection cancellation or renewal news, as well as updates on my dinner plans. After all, everyone loves love. 8/10 update: FOX has renewed Love Connection for season two. Details here. Excuse me, while I eat my hat, instead. Find more Love Connection TV series news or other FOX TV show news. What do you think? Are you happy the Love Connection TV show was renewed for a second season? How would you feel, had FOX cancelled this TV series, instead? What happened to Love Connection? It hasn’t been on and I miss it!!!!!!! I love this show and was very disappointed that it was not on last night. The shows that were on instead were awful so I watched something else. Never watched it so I couldn’t care less.